Optimizing Your Draft Picks: An Evaluator's Perspective - CCNY Inc. This week, we invited CCNY evaluator, Dr. Caitlin Biddle, to do a guest post about a subject near and dear to her heart. Read on to find out how she applies data analytics to creating the ideal fantasy football team. Fantasy Football Season is quickly approaching and that means the race is on to draft a winning team! The most important components of a solid fantasy team are a good quarterback (QB), running back (RB), and wide receiver (WR). Now there are numerous rankings out there to help you pick the best player based on projections, like this one, but because I work in Evaluation and Data Analytics here at CCNY, I am always looking for the right metrics to inform decision-making. This led to me to wonder about the consistency of players and how to best analyze that. The rationale here, is that the more consistent a player is, the less risky they are, so it is all about striking a balance between high performance and reliability. 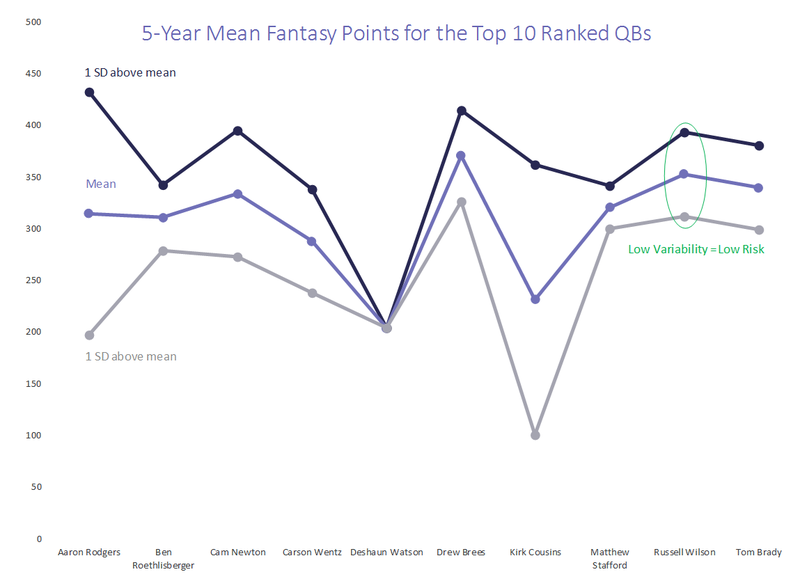 A lot of these trends look fairly stable, but we can see some players started off their career slow (i.e., Kirk Cousins), are increasing (i.e., Carson Wentz), or don’t have data for all five seasons because they are newer players (Carson Wentz and Deshaun Watson: both of whom happened to get injured last season). However, I wanted more information than just their career trajectory, therefore I looked at the mean over the last five years to give me some insight on level of performance and the standard deviation to tell me how consistent their performance is. It is clear that Kirk Cousins has a great deal of variability and may be risky; but you also have to keep in mind that 2013 and 2014, he was not the starter and only played 5 to 6 games, respectively. If you look at just the three years he started, then he has the lowest variability out of all of them by almost two-fold and may actually be trending up. Aaron Rodgers also has a lot of variability, but it is most likely due to his injuries in 2013 and 2017, which injuries will affect consistentency of performance and should still be considered. Only Russell Wilson and Matthew Stafford have played all five seasons without missing any games. 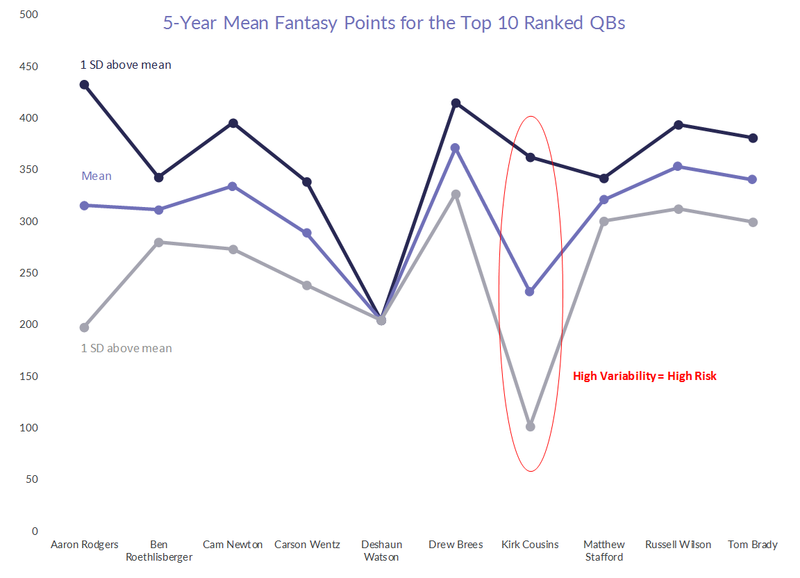 Matthew Stafford, Russell Wilson, and Ben Roethlisberger have the lowest variability, which is impressive for Roethlisberger because he hasn’t played a full season since 2014 due to injuries. As you can see, there is not a single silver-bullet piece of data that has all the answers. Moreover, the data means nothing without subject matter expertise (which is true of our work here at CCNY as well). Based on my analyses, if you are looking to strike a balance between performance and consistency, your best bet is Russell Wilson. 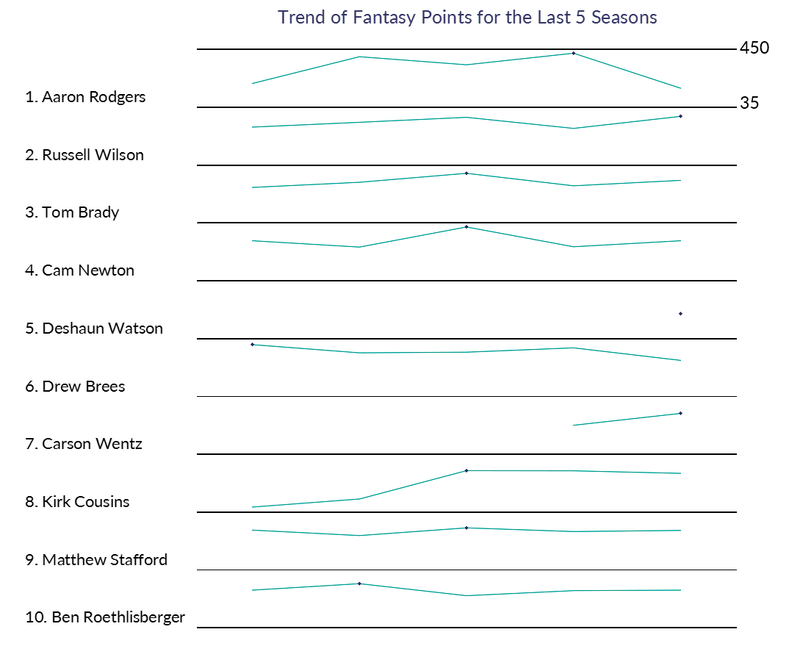 He has the second best five-year fantasy point mean (352.6 vs 370.4; Brees at number 1), he is in the top three of most consistent players, and has played in every game in the last five years. Your next best bets are Tom Brady (ugh, it hurts just to type it!) and Drew Brees. I wish all your fantasy teams luck and GO BILLS!